You might be fencing your property because you’ve decided to get a pool and you need to adhere to local legislation, or because you recently adopted a family pet. Perhaps you’re after a little more privacy or added protection for your property? Or maybe you’re getting a fence installed because you’re a little bit sour about the fact that people throughout the neighbourhood keep helping themselves to lemons from your tree. No matter your motivation for fencing your yard, doing your homework is a crucial first step. You will need to be familiar with any applicable fencing regulations that might impact upon your decision. There is nothing worse than being well underway with your fencing process only to find out that you haven’t complied with local laws or height allowances. Navigating legal terrain can be challenging for anyone, so if you’re not sure what to make of all of it, consider contacting local experts for advice. While fencing the yard will ideally be something you only have to do once, industry professionals do it all the time, and they’d likely be more than happy to share some of their insights and expertise. We’re all guilty of going to the supermarket for a mere handful of essentials, only to end up leaving with a full trolley. In the context of groceries, going in blind can be fairly inconsequential, but in the context of fencing the yard, it’s best to have a clear idea of your wants and needs before you get underway. To do this, you need to keep the motivation behind your decision at the core of all subsequent decisions. A knee-high picket fence – while quaint and remnant of quiet suburban life – won’t do a great job of containing the family Labrador, nor will it act as an impenetrable force against thieves. A 23-foot-high by 5,500-mile long wall made from stone, brick, and tamped earth would surely serve as a tremendous military defense, but you would probably have cause to argue that it verges on excessive for a domestic pool safety barrier. Another crucial thing to keep in mind is your budget. Now more than ever, people favour the pay-less-now option. Many modern day stores cater to this market by making and selling items that are cheap, because they’re designed to fill short-term needs, and then be replaced. While the more expensive option is in no way guaranteed to be the best option, going for the cheapest choice could end up costing you more further down the line. The key here is to focus on value for money. Ask yourself questions like: how long is this fence likely to last? Is it cheaper because the materials aren’t designed to last? Will it need regular maintenance and repairs? Fencing your property is an investment, and the best way to get a positive return on any investment is to allocate your money wisely. Again, if you’re not sure which fencing option is best for you – talk to the experts. Having a fence surrounding your property is a proven method for deterring thieves and trespassers, but that doesn’t mean that your home needs to look foreboding and impenetrable. 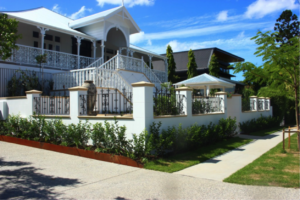 You can add to your property’s security without detracting from its aesthetic appeal. If you’re not sure which style of fence is best for your home, then take a nosy around the neighbourhood! Perhaps you like what house number 47 has done with their fence? Why not jot down what you like about it, then go away and research it? Hate the look of house number 28? Great! Simply add that to your list of fence styles to avoid. A quick wander down the street might help to inform your decision in a big way, either through the gaining of inspiration, or the process of elimination. Ok, no… You shouldn’t be excessively concerned with material possessions – but you should be excessively concerned with materials! For most of us, the word ‘fence’ will conjure an image of chain-link or wood. Yet there’s little evidence to suggest that these incredibly common fencing materials are actually the best. Constant exposure to the elements can cause the wire to rust, and the material is easy to cut through. Likewise, wood can be incredibly high maintenance, needing regular paint applications to prevent fungus or rotting. Stone fences can look fantastic, but they require a lot of hard labour on being installed. One material that has become increasingly popular amongst homeowners is wrought iron, which is widely considered to be one of the most robust fencing materials available. It is incredibly strong, which makes it excellent for security purposes, but it is also elegant and timeless. There can be advantages and disadvantages associated with most fencing options, it’s just a matter of evaluating those throughout your decision-making process. Remember, fencing your yard doesn’t have to be a tedious or laborious ordeal. If the notion of having a bland, wood panelled fence built around your yard doesn’t excite you, then try to choose something that does! Your fence doesn’t just need to serve as a boring, means to an end method of keeping your border collie from harassing the mailman – it can be a value adding way of making your property a neighbourhood standout. Regardless of whether you’re trying to keep animals in, people out, or just preserve the berries growing in your garden, you can choose from a range of innovative new fencing designs and materials, all without having to compromise on functionality or durability. Are you looking to fence the yard in your home? Contact the experts at Dean-Wilson Iron today on (07) 3814 0076.